Your quest for a high and tight collared shirt that won’t stretch or sag is over!! Pro Club T-shirts are made in the USA. 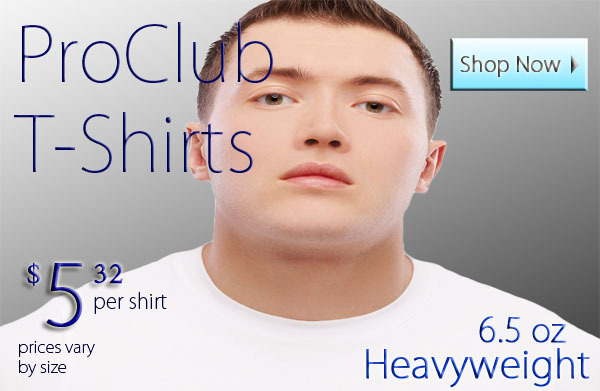 Heavyweight Pro Club T-Shirts are heavy duty cotton tees with a nice soft hand feel. The shirts are pre-shrunk and made of 100% cotton. Customers love Pro Club T-Shirts because the collar keeps its shape overtime without stretching out or sagging. Find the perfect tee in a Small, Large Tall, 2XL Tall all the way up to a 10XL. Pro Club T-Shirts come in all colors and sizes. Pro Club T-Shirts are the "Freshest White Tees" made to last. Get yours here today at a bargain price. Pro Club T-Shirts are available in “Tall” sizes. The Extra length found in our Pro Club T-Shirts is great for the Big and Tall. Pro Club T-Shirts are the original Tall Tee trend setter. Pro Club Tees are worn all across the country. People are Rockin’ Pro Club T-Shirts from LA to the East Coast. You can even find loyal Pro Club T-Shirts customers Worldwide. Pro Club Mixed 3pack - You choose 3 colors. Purple Pro Club T-Shirts (2 T-Shirts) 100% Cotton.